EDIE stands for “Estimating Data Intelligence Engine” and is a core part of Thunderbolt Pipeline’s bid estimating system. It is the Artificial Intelligence (AI) engine that helps your company’s estimators create bids that increase profitability, while simultaneously maximizing the odds of those bids getting accepted by your customer, and it is available exclusively for Thunderbolt Pipeline users. But EDIE isn’t just a static formula! With every bid you save in the system, EDIE’s algorithms iteratively learn, finding hidden insights that might not be completely obvious to humans. EDIE is able to continually learn and mimic cognitive functions in a digital environment, delivering your company the information you need to make the best possible bid. This isn’t the Artificial Intelligence of the 1980’s…new computing technologies have made it possible for EDIE to advance far beyond the AI of the past! How do I use EDIE? The green range in the middle is the estimated range EDIE believes your bid should be within to maximize the chances of winning the job. 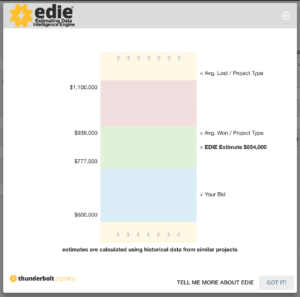 On the right side of the screen, EDIE has shared the average won and lost bids (based on the size of your job), and EDIE shows you where your bid (if you put an amount in the Submitted Dollars field) is compared to EDIE’s suggestion. And after your bid is saved, EDIE immediately uses that data in future estimations!